Kaffee Haus at Branson’s Center Stage is a new restaurant in Branson that offers wholesome food for the whole family. This new restaurant offers nicely handcrafted specialty espresso beverages, Italian cream soda, loose teas, fresh squeezed lemonade, and sell vintage sodas. In addition, the restaurant has many gluten sensitive options. 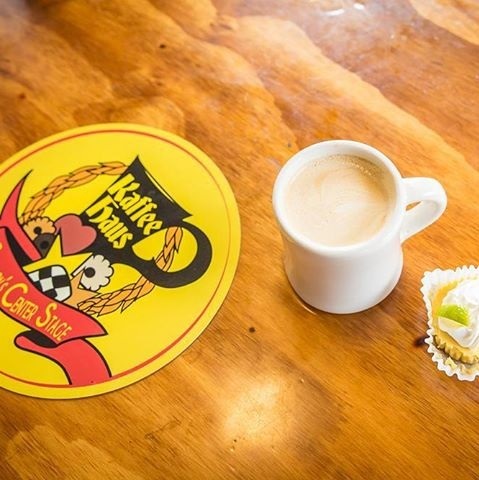 Kaffee Haus opened its doors in April this year 2016 in a great location in an old dining car attached to the front of Branson’s Center Stage Grille and Bar. This new restaurant in Branson is excited to offer local residents and visitors alike an experience that allows you to sit on the couch, sip a handcrafted espresso, and indulge with the sweet recipe. The restaurant has an extensive line of gluten options. Kaffee Haus features an extremely inviting décor, the couches offer comfortable seating and the coffee is just fantastic. Amber Brown, manager of Kaffee Haus assures guests that they have a full staff of trained baristas making the best coffee in town. In addition to the stellar coffee they serve, the restaurant also offers a line of traditional made-from-scratch German pastries. At Kaffee Haus, guests can enjoy free WiFi. This Kaffee Haus at Branson’s Center Stage Grill and Bar makes a very good coffee made the way you want it. This coffee shop will be offering also homemade pastries and desserts for locals and tourists alike. You will find in this coffee house lots of gluten free options and dairy free alternatives such as soy milk and almond milk. Once you are inside the restaurant, you will notice a quiet and cozy atmosphere, with outdoor seating and tables. If you are looking for a low key coffee shop but offers delectable meal followed by a yummy dessert, this is the place to go. Kaffee Haus is also now the exclusive distributor of Paul Wohlfeil’s Costa Rican specialty coffee. This coffee is used in the coffee pourovers and it is benefitting Noah’s Ark Foundation. This foundation develops free professional mental health and legal services to promote good health for individuals and families in Costa Rica. This coffee shop takes pride on their homemade desserts, pastries, and gluten free offerings. Branson’s Center Stage Grille and Bar where Kaffee Haus is set has quickly become known as Branson’s Center Stage. This family-owned bar and restaurant is managed hands-on by Leah Smith Kendall, Bill Kitchin, and Dan Smith. The Kaffee Haus located in a separate room at the front of the building is managed by Leah’s sister, Amber Brown. This coffee restaurant at Branson’s Center Stage offers a variety of sweet treats, flavored iced and hot teas, flavored iced and hot coffees, as well as many other delicious edibles and quenchibles. The restaurant can easily be accessed from the parking lot, patio, or inside Branson’s Center Stage. Kaffee House at Branson’s Center Stage is a new restaurant in Branson where you can enjoy the good taste of handcrafted specialty espresso beverages, Italian cream soda, fresh squeezed lemonade, and loose teas.